WD 10TB RED PRO drives are created for storage of 8 to 16 bay NAS solutions. Pro drives are faster and more reliable compared with regular Red drives. WD Pro drives are designed to work in 24x7 environment. And with 5 years warranty it will run 24x7 for five years or longer. WD Red Pro hard drives integrate WD’s exclusive technology, NASware™ 3.0, to provide unparalleled support for drive compatibility, reliability, and performance. These drives are designed specifically with SMB (small and medium-sized business) customers in mind. In business environment speed and reliability is important and this is what WD red pro 10TB drives will do. With capacity of 10 TB, WD Red Pro carries a 5-year limited warranty and was engineered to handle the increased workloads from your business. Every WD Red 10TB Pro drive has exclusive NASware 3.0 technology built into. NASware 3.0 enables seamless integration, robust data protection and optimal performance for systems operating in the demanding NAS environment. WD 10TB extensive NAS partner compatibility- testing provides reassurance that WD Red Pro will be the most compatible drive available in many NAS environments. NAS for Big Business. With NASware 3.0 WD increases system compatibility allowing for seamless integration with your existing network infrastructure. WD 10TB red pro drives offer increased efficiency and productivity for your business. 8 to 16 Bay Shock Protection. Multi- axis shock sensor that automatically detects subtle shock events and dynamic fly height technology which adjusts each read-write function to compensate and protect the data increases reliability of WD Red Pro drives in NAS 8-16 bay environments. Vibration Protection. WD Red Pro features hardware vibration compensation technology which monitors the drive to correct both linear and rotational vibration in real time, further increasing drive reliability. Positional accuracy. StableTracTM technology secures the motor shaft at both ends to reduce system-induced vibration and stabilize the drive platters for accurate tracking during WD Pro drive read and write operations. 3D Active Balance Plus. If drives are not balanced properly they can cause excessive vibration and noise in a multi-drive system. WD 10TB red pro drives are perfectly balanced which improves hard drive lifespan and performance. Extended thermal cycle burn-in testing. Hard drive with added vibration, heat and other factors need to be extra reliable. Therefore WD has extended burn-in tests for WD WD101KFBX drives. Error Recovery Prevention. NASware 3.0 prevents the drive from fallout in RAID applications. Longer Warranty Coverage. WD Red Pro drives are created even more reliable than regular Red drives. 5 years warranty proves the fact. In business environment it is important to have reliable solution in place. WD Red Pro 10TB drives will give this peace of mind for 5 years and even longer. WD 10TB RED PRO drives are created for storage of 8 to 16 bay NAS solutions. Pro drives are faster and more reliable compared with regular Red drives. WD Pro drives are designed to work in 24x7 environment. And with 5 years warranty it will run 24x7 for five years or longer. WD Red Pro hard drives integrate WD’s exclusive technology, NASware™ 3.0, to provide unparalleled support for drive compatibility, reliability, and performance. Every WD Red 10TB Pro drive has exclusive NASware 3.0 technology built into. NASware 3.0 enables seamless integration, robust data protection and optimal performance for systems operating in the demanding NAS environment. WD 10TB extensive NAS partner compatibility- testing provides reassurance that WD Red Pro will be the most compatible drive available in many NAS environments. NAS for Big Business. With NASware 3.0 WD increases system compatibility allowing for seamless integration with your existing network infrastructure. WD 10TB red pro drives offer increased efficiency and productivity for your business. 8 to 16 Bay Shock Protection. Multi- axis shock sensor that automatically detects subtle shock events and dynamic fly height technology which adjusts each read-write function to compensate and protect the data increases reliability of WD Red Pro drives in NAS 8-16 bay environments. Vibration Protection. WD Red Pro features hardware vibration compensation technology which monitors the drive to correct both linear and rotational vibration in real time, further increasing drive reliability. Positional accuracy. StableTracTM technology secures the motor shaft at both ends to reduce system-induced vibration and stabilize the drive platters for accurate tracking during WD Pro drive read and write operations. 3D Active Balance Plus. If drives are not balanced properly they can cause excessive vibration and noise in a multi-drive system. 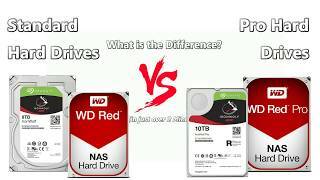 WD 10TB red pro drives are perfectly balanced which improves hard drive lifespan and performance. Extended thermal cycle burn-in testing. Hard drive with added vibration, heat and other factors need to be extra reliable. Therefore WD has extended burn-in tests for WD WD101KFBX drives. Error Recovery Prevention. NASware 3.0 prevents the drive from fallout in RAID applications. Ideal for: Specifically designed and tested for medium to large business NAS applications with 8 – 16 bays. For systems that use less than 8 bays, please consider WD Red hard drives unless you really need this extra performance and reliability.